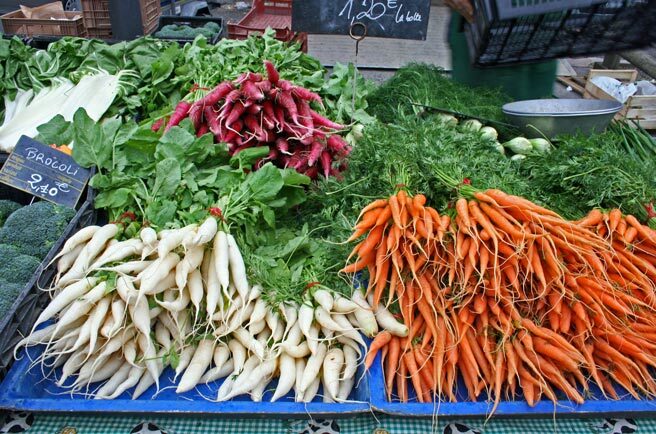 There are 43 official outdoor markets within the city limits of Lyon. Many many more when you count the suburbs and neighboring towns, which are well connected by metro, bus, and tram to the city center. No matter where you live, there is a regular market within a few minutes on foot where local fresh fare is available for sale, if not every day, at least a few times a week. Each market has its own draw, sometimes as simple as the goal to provide fresh fare to a neighborhood on a regular basis. Some markets feature only organically grown goods, some restrict their stalls' criteria to be open to farmers only, some spanning for blocks, some as small as three vendors, but each meeting the neighborhood's needs. Some markets welcome sellers of manufactured items on one day of the week, and I plan to document what kinds of gems they have tucked in here and there. As a chapter in my project to bring the food and wine of Lyon to you, I am visiting every single one of Lyon's outdoor markets during these next few months. I am noting the best way to get to each one, soaking in the vibes, talking to the vendors, observing what similarities the markets share, and noting what each one claims as their own. As Spring unfolds, the pages fill, noting particular attractions, bus lines and metros, schedules and stories, so that the task of choosing will be easier for a traveler or newcomer to Lyon. Of course I'll be taking photos, and each has its own history and clientele. I want carrots, I want them cold and crunchy, I want them frizzled and buttered...I want them from a pretty little stand like in the photo. Golllly, great great photo! Being frozen in the tundra of New York City, I'm so looking forward to having you deliver some spring to me! Lovely photo! Tace, thanks for sharing your enthusiasm! Joanna, I look forward to sharing it with you! Laura, hang in there, Spring is on the way! Angela, sure! Hop in the basket! There are many reasons why, in an ideal world, I'd love to live in France - the markets are definitely one of them! Oh, lovely. After this you'll have all the market bons plans in Lyon! It should be really interesting to see the variations in products from quartier to quartier. Before you go to St. Louis I will plot out the location of my favorite vendors! I went to Lyon once many years ago, and one of my fondest memories is of the markets...and the Marquise au Chocolate that I enjoyed at a little cafe near the Cathédrale Saint-Jean). When we lived in Andorra we went to outdoor markets all the time - especially across the border in Spain. I loved them! Here, living in the midst of small villages, the markets are all enlosed...and, of course, we have to drive to them. Some day I want to live in a city where I can walk to markets... Maybe when I grow up!